Tony Yao has been an avid fan of Japanese pop culture since junior high school. He is currently the Production Coordinator/Writer for Samurai Beat Radio and blogs about the psychological aspects of anime/manga/video games at Manga Therapy. In his spare time, he enjoys exercising, watching sports, hanging out with friends, eating, a lot of sleeping, and obsessing over his favorite anime/manga series, Gintama. JapanCulture•NYC is happy to have Tony on board for dispatches from last week’s New York Comic Con. Tony attended Japanese-related panels, interviewed guest speakers, and dissected the future of manga. Here’s part one of Tony’s three-part series about NYCC. On October 11-14, 2012, the geeks of New York City re-emerged to rule the Big Apple with an iron fist. That’s right, folks. New York Comic-Con once again reared its glorious head among the masses. About 116,000 pop culture fanatics came and filled the Jacob Javits Center with cosplay, cameras, and unbridled passion for their favorite series. 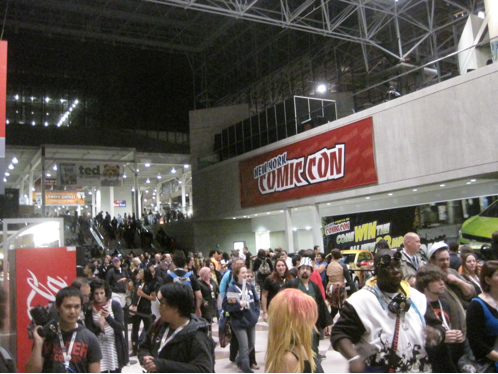 This year marked the official end of New York Anime Festival after 4 years of being a separate event, as it became officially integrated into NYCC as a whole. 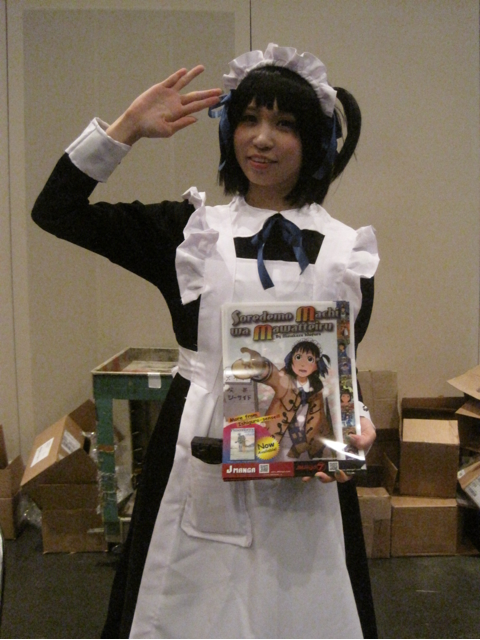 However, this hasn’t stopped Japanese pop culture from making an impact at this year’s NYCC. With help from Dark Horse Comics, JManga, SUNRISE, Vertical Inc., Viki, and the Japan Foundation, the imagination of Tokyo shined through in the bright lights of New York City. First off, Dark Horse Comics brought Yoshitaka Amano (famous for being the illustrator of the Final Fantasy video game series and Vampire Hunter D). This was his second time at a New York convention as he was a guest at NYAF back in 2008. Unfortunately, I did not attend Amano’s panel on Friday as it ended at the start of the “Japan Foundation Presents: Yu Asakawa” panel. There is a good recap of Amano’s panel at Anime News Network, where he talked about his works, his love of New York, and his upcoming project, Deva Zan. The first panel I attended was “The Japan Foundation Presents: Yu Asakawa.” Yu is a very popular and accomplished voice actress (15-16 years in the business) back in Japan. She is perhaps best known for her roles as Sakaki from Azumanga Daioh, Motoko Aoyama from Love Hina, and Itoko Osakabe from School Rumble. It just so happened that the panel was moderated by Danny Choo, who is the world’s greatest and most successful otaku today (and another Japan Foundation guest). 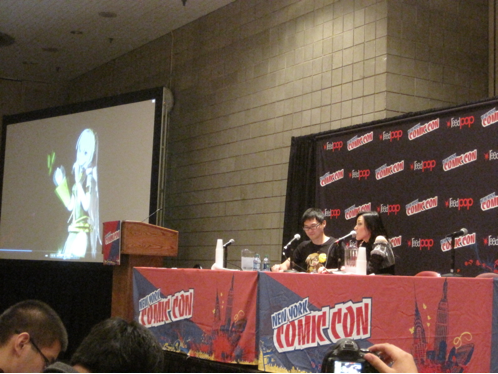 The panel mostly had Yu talk about how she got started in voice acting, her desire to speak English, and her feelings about being the voice of Vocaloid’s Luka Megurine. She also sang a popular song by Luka, “Just Be Friends” in her natural voice, much to the delight of many Vocaloid fans in the audience. In the end, Yu took a group picture with the crowd at the panel. This was the first time she’s ever been to NY and she noted that we use too much electricity. 🙂 Yu Asakawa was quite a darling and her English was actually pretty good. 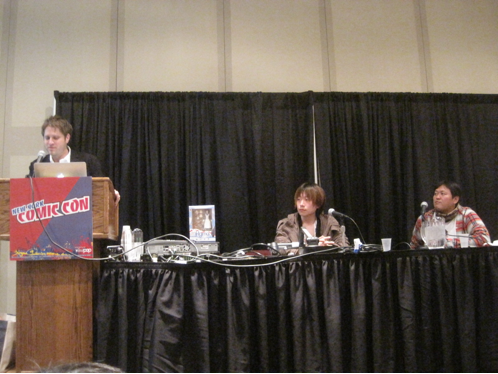 The next panel I attended on Friday with big-name Japanese guests was “JManga Presents: Masakazu Ishiguro”. JManga is a coalition of about 40 Japanese manga publishers who are trying to put out a wide variety of manga digitally to a global audience and promote manga culture. The panel was moderated by Robert Newman, JManga’s PR representative and an overall cool guy. Robert welcomed Masakazu Ishiguro, the mangaka of それでも町は廻っている(Soredemo Machi wa Mawatteiru, “And Yet The Town Moves!”, SoreMachi for short) and Masahiro Ohno, Ishiguro’s editor and editor-in-chief of Young King OURS. This was a pretty entertaining panel as Ishiguro did a live-drawing of one of SoreMachi’s characters and many SoreMachi goodies (figures, DVDs, manga volumes) were given away to lucky fans who yelled certain Japanese phrases (i.e. “MITTAE!”, “HOSHI!”, etc.). A Google Nexus 7 was also given away as well. The funniest part of the whole event was that there was a dance-off to win a SoreMachi Figma figure and everyone was left speechless. You had to see it to believe it. Finally, there was a cute cosplayer who cosplayed the main character of SoreMachi, Hotori Arashiyama. Cute, isn’t she? That’s it for Friday! Stay tuned for the Saturday and Sunday recaps featuring Moyoco Anno, Danny Choo, Masakazu Katsura, and much more! Here are Tony’s Part II and Part III. Previous Previous post: JapanCulture•NYC Talks to Go Ramen!